The Ultimate Flokati. Need we say more? 4,000 grams/m2, we couldnÂ’t fit any more Flokati into the Ultimate Flokati rug. The Ultimate Flokati is your chance to finally walk on a cloud. Soft, full, plush and magnificently beautiful. The Ultimate Flokati rug is the premier choice for the experienced Flokati fan. Keep away from doors! This Flokati is so thick (ALMOST 4Â” HIGH!) it might not fit under your door gap! 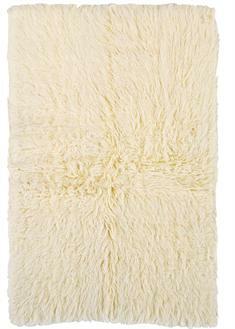 Offered in the Natural White color, and 7 sizes, the Ultimate Flokati is first rate! DonÂ’t see the size you want in the Ultimate Flokati? No sweat! WeÂ’ll make it for you, just ask and weÂ’ll get you the Ultimate Flokati in the Ultimate size!